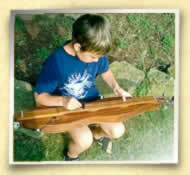 The dulcimer is an awesome “first instrument” that anyone can play. After your dulcimer is tuned, you can play any fret (the space in between the metal markers) on the first string and never hit a bad note! It’s a great way to begin playing a real instrument in minutes and practice hearing and creating melodies. Making your own dulcimer is a bit tricky and requires some special tools. However, it is a great adventure and well worth the effort! There is an awesome, “make-your-own” cardboard dulcimer kit available in the DariaMusic Store. A friend of Daria’s has created an awesome sounding cardboard dulcimer that is excellent for a child or adult who wants to begin playing the dulcimer. They are quite sturdy and look and sound great at a very reasonable cost! You can check them out in the DariaMusic Store. 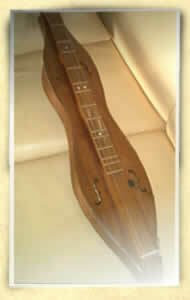 On the internet there are several good dulcimer kits, dulcimer making videos and beginner wooden dulcimers. If you’d got the dulcimer bug, e-mail Daria and she can send you an up-to-date list of dulcimer resources.